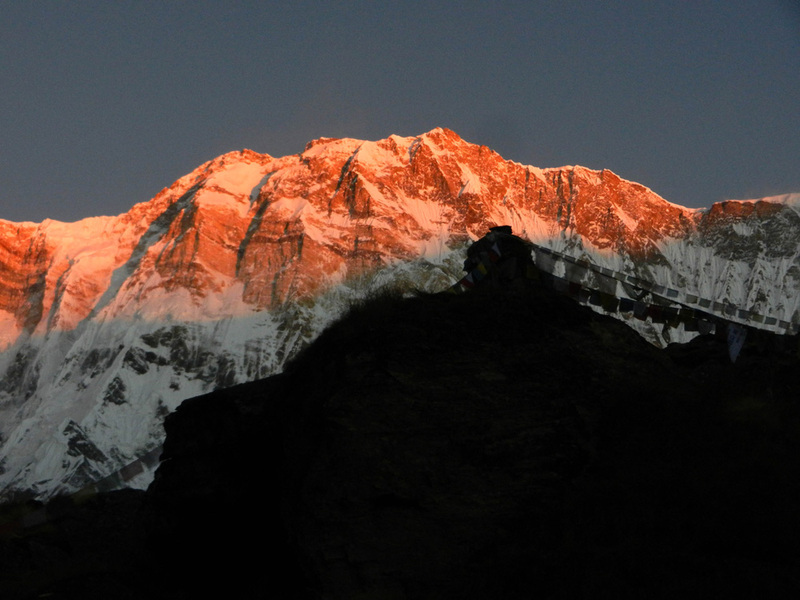 This was the fabulous view from the heart of the Annapurna Sanctuary at Annapurna Base Camp (4,130m or about 13,550 ft) of the evening sunset light on the sheer face of the Holy Mountain Machhapuchhre (Fish Tail Mountain) 6997 metres = 22,956 ft. This is Grant and Johnny at the heart of the Annapurna Sanctuary (4,130m = 13,550 ft) one of the highest points we reached with our guide Arjun (left) and our porter Rajendra (right). This is 500 metres higher than the top of Mount Robson, the highest mountain in the Canadian Rockies!!! The mountain in the background is Annapurna III (7,855 metres = 25,770 ft) with the Snow Dome on its shoulder. 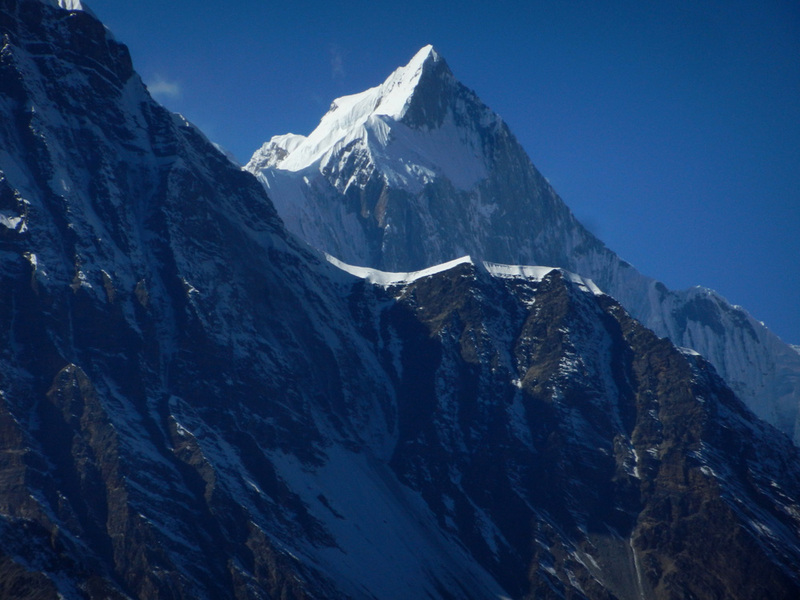 This photo shows Annapurna I (8, 091m = 26,550 ft) the highest mountain in the Annapurna Himal. It is the 10th-hightest mountain in the World! The photograph is taken from the trek up to Kang-La pass from Ngawal and shows the infamous South Face on the left, the route taken by Chris Bonnington's party in 1970. Sunrise on the summit of Annapurna I (8, 091m = 26,550 ft) from Annapurna Base Camp with a chorten and Buddhist prayer flags in the foreground. The route taken by Chris Bonnington's party in 1970 is just up just slightly to the left of the summit. For lots more photos and details start your tour with us on our first day in Patan (the city across the river from Kathmandu).